"Metatask is a flexible BPM & Workflow Software that helps organizations to increase efficiency by streamlining and managing business processes, reducing chaos, eliminating errors and delays." Metatask scored 74/100 in the Business Process Management (BPM) category. This is based on user satisfaction (90/100), press buzz (30/100), and other relevant information on Metatask gathered from around the web. Metatask is a business process and workflow management software solution and is known as BPM software. It is developed to help simplify and streamline the way companies manage and organize day-to-day operations and internal processes, providing teams the ability to perform repetitive tasks more consistently and effectively. The BPM software solution is designed for all types of workflows and internal processes of small to medium-sized businesses, startups and large enterprise companies, whether it’s onboarding of newly hired employees, processing purchase orders, processing vacation requests, initiating new software development projects, creating and implementing marketing campaigns, conducting reviews, conducting interviews, developing business websites, approving company expenditures, advertising real estate properties, and so on. 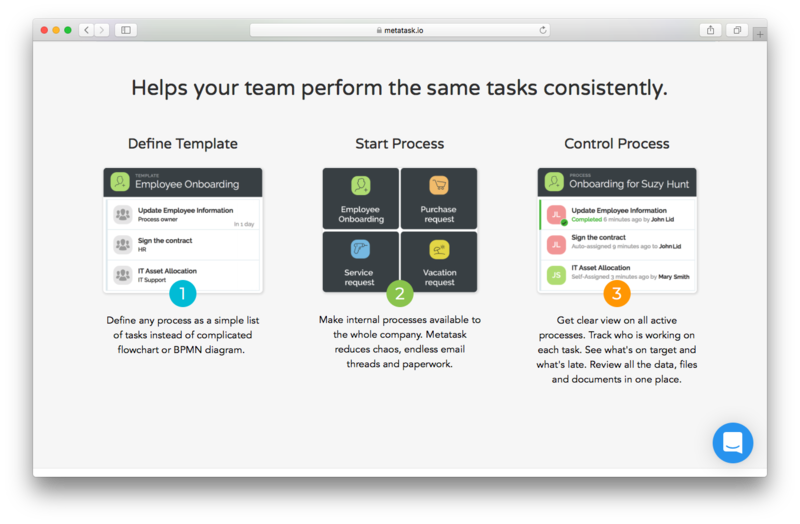 Metatask is ideal for teams and departments that regularly conduct recurring internal processes like reviews, onboarding, and approvals. The BPM solution provides a wide range of features, such as internal process sharing, a fairly sizeable collection of workflow templates, task management, control process management, chat functionality, custom forms, and Zapier integration. Everything you need to effectively and efficiently manage day-to-day business processes with your team is readily available in a diversified, easy-to-use platform. The software solution enables users to properly define internal processes as a simple sort of a to-do list, instead of having to deal with relatively complex flowcharts and/or BPMN diagrams. Once you have the internal processes put on a list, employees and team members will be able to access this list via the Metatask system. It’s easy to see that this will increase efficiency as it effectively removes the need for email threads, paperwork, and other unnecessary actions. Monitoring and keeping track of all the processes—seeing who is working on which task or project—is relatively quick and simple. 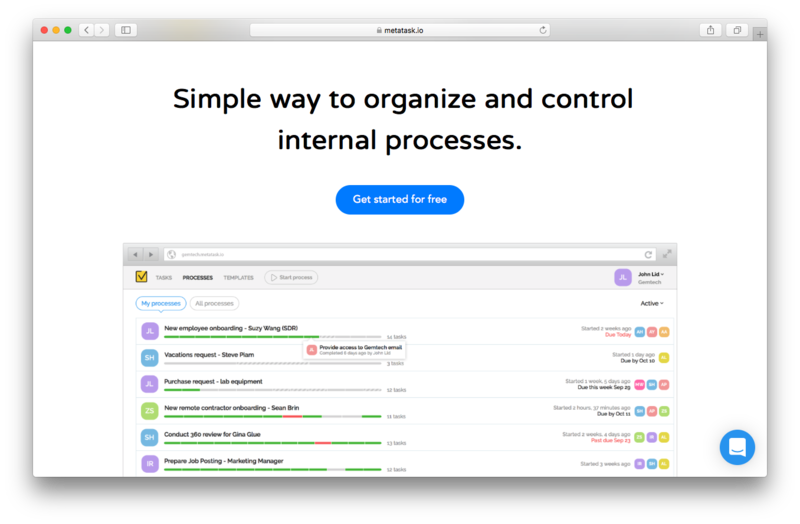 Metatask is a feature-rich business process management solution with all the tools and applications you need to review documents, access files, monitor progress, keep track of tasks, gather data, and take full control over all your processes. All functions and capabilities are conveniently packed into a single, unified environment. Initiating processes for common tasks like onboarding, reviews, processing requests, and more is simple and time efficient. Seeing the progress of all ongoing tasks carried out by other teams or reviewing results of previously completed projects is also quick and effortless. Additionally, tasks or processes that are overdue are quickly identified through color-coded progress bars and red alert statuses outlining impending or past due dates. Delegating tasks and assignments can be done once the process is created. You are able to assign specific tasks to relevant team members and set due dates for those tasks automatically, based on pre-set parameters and trigger rules. A chat tool is available for employees and team members to use when collaborating on tasks and projects. The same chat tool can also be used to share files, updates, and other pertinent data. The form functionality is useful for extracting critical data from chat comments and email attachments, giving admins full control over who, when, and how users provide or share process information. Metatask comes packed with a large number of key features, in addition of course to process and assignment management, workflow management, customizable templates, business process control, and task management. Its other features include process modeling and design, task tracking, collaboration tools, process tracking, forms management, Zapier and MS Flow integration, to-do list functionality, chat capabilities, and much more. With Metatask’s core features and capabilities, users have the ability to always be on top of their company’s internal processes, from financial auditing to application development for mobile phones and tablets. The workflow management feature allows users to effortlessly handle workflows that are otherwise more complicated with BPMN diagrams and charts. This is mainly because Metatask defines internal processes as a list, effectively cutting down the time you would normally spend on most common business processes. With Metatask BPM software, certain tasks and processes, including requests, are automatically forwarded to authorized or qualified personnel. The solution also automates the scheduling of due dates and facilitates the collection process and utilization of documents, file attachments, and other relevant information. For managers and department heads, on the other hand, Metatask makes assigning tasks and distributing crucial information to teams and groups quicker and easier. Employees, team members, and assigned personnel are able to easily pull tasks from queues of available/pending tasks, instead of waiting for managers and supervisors to assign the task to them. On top of business process management, task management, template management, and other core features, Metatask also offers built-in forms with rules that are essentially user-defined. Users can set who can see form fields, which individuals can enter which piece of information, who gets assigned editorial rights, and so on. With Metatask, users also have full control over relevant data by simply utilizing required fields and a variety of supported field types like email, text, currency, number, as well as file attachments. The software solution comes with real-time communication tools and capabilities, including quick chat, which enables employees and team members to instantly share comments and information on tasks and ongoing projects. Using the quick chat and other communication features, you, your teammates and other users are able to submit comments and input suggestions, as well as individuals also possessing the ability to quickly respond to questions, address concerns pertaining to the project or task they’re working on, attach files, and work with collaborators more easily and efficiently without the need for other third-party programs and applications. 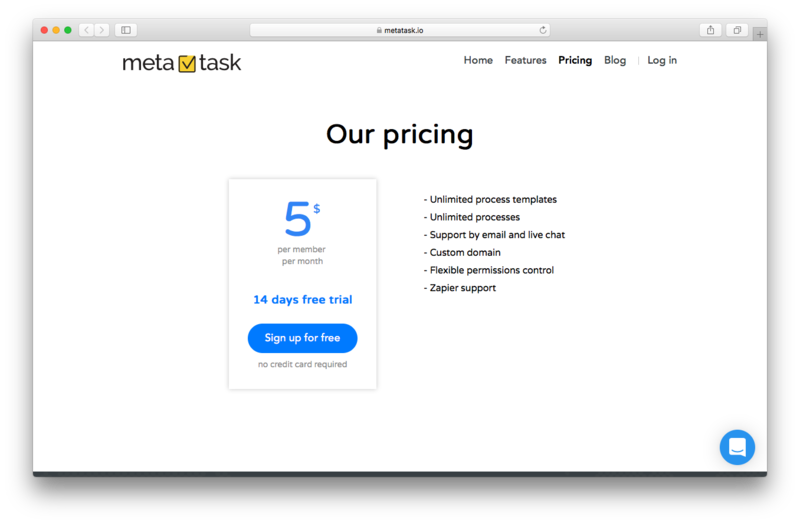 If you want to check out the product further, Metatask offers a 14-day free trial with no credit card required. Simply visit the company’s official website and sign up for the free trial. You may also contact them directly for additional information about the product as well as your personal pricing options. Metatask BPM software solution provides a simple and efficient way to organize and manage internal processes of businesses of all types and sizes. It is specifically designed to help your team perform repetitive, day-to-day tasks in a consistent and effective manner. With Metatask, you simply define the process as a simple list. Initiate the process by making it available to the entire company and take full control of the process by utilizing the available tools and capabilities built-in to the platform. Metatask comes with built-in communication capabilities and tools, as well as seamless integration with other third-party solutions such as Zapier, Google Drive, and even some of the CRM systems commonly used by most companies today. Product recommendations, vendor rankings, market overview and tips on how to select Business Process Management (BPM) software for business. Published in April 2019.